The global market for diabetes injection pens is highly consolidated in nature with a few players holding a key share of the overall market, states a research study by Transparency Market Research (TMR). With the rising number of players, expected to enter the market, the competition is expected to rise substantially throughout the forecast period. 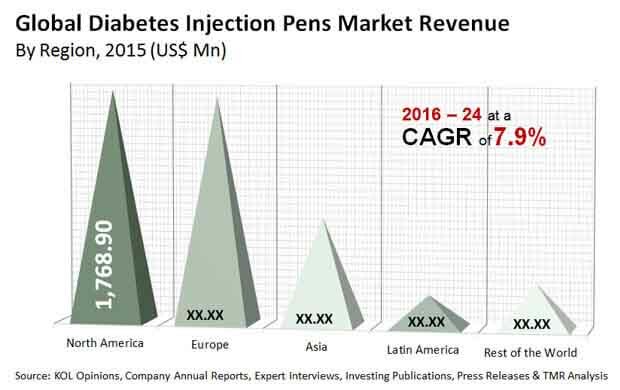 The key players in the global diabetes injection pens market, namely Novo Nordisk A/S, AstraZaneca plc, Sanofi S.A., Eli Lilly and Company, and Biocon Ltd. are predicted to collectively hold a massive share of the market in the coming years. These players are emphasizing on technological advancements and new product development in order to maintain a leading position in the global market. The rising number of players predicted to participate is expected to enhance the competitive environment of the overall market in the near future. As per the research study by Transparency Market Research, in 2015, the global market for diabetes injection pens was worth US$4.9 bn and is expected to reach a value of US$9.7 bn by 2024. The market is likely to register a healthy 7.90% CAGR between 2016 and 2024. Among the key regional segments, Europe and North America held a massive share of the global diabetes injection pens in the last few years. As per the study, these two regions are anticipated to remain the leading positions throughout the forecast period. A significant contribution from the U.S. and tremendously rising diabetic population are estimated to supplement the growth of the North America market. On the contrary, Asia Pacific is anticipated to register a progressive growth rate in the coming years, thanks to the development of new products and the increasing purchasing capacity of patients. Moreover, favorable rules and regulations imposed by government bodies are likely to contribute widely towards the growth of the market. On the basis of product type, the global market for diabetes injection pens has been classified into pen needles and insulin pens. The insulin pens segment is expected to lead the global diabetes injection pens in the next few years, owing to the rising inclination of consumers towards it. On the flip side, the pen needles segment is likely to generate to generate substantial contribution, as these products are comparatively cheaper. The increasing cases of diabetes are predicted to encourage the growth of this segment in the coming few years. The rising prevalence of diabetes and the increasing number of insulin syringe needle stick injury cases are estimated to fuel the growth of the global diabetes injection pens market in the forecast period. Technological advancements in digital insulin pens and the increasing purchasing power of consumers are likely to accelerate the growth of the overall market in the next few years. In addition, the introduction of smart insulin pens that are connected with mobile applications is predicted to boost the demand across the globe. Furthermore, the rising acceptability of novel technologies and the growing geriatric population are some of the key factors that are expected to encourage the growth of the global diabetes injection pens market in the forecast period. The global diabetes injection pens market, on the contrary, is predicted to witness a downward trend in the coming years, owing to the high prices of pens. Moreover, the rising threat of alternative technologies for delivery of drugs is estimated to hamper the growth of the global diabetes injection pens market in the near future. Nonetheless, the promising opportunities for the key players due to the introduction of the connected devices in blood glucose monitoring is likely to supplement the growth of the market in the coming years.